Oak Park Mall plans to create a "new identity" after Nordstrom leaves in 2021 for the Country Club Plaza. OVERLAND PARK, Kan. — Oak Park Mall plans to create a "new identity" after Nordstrom leaves in 2021 for the Country Club Plaza. The vision for that new identity could take a number of forms, according to Oak Park Mall Marketing Director Elizabeth Mathews. "It could be divided up into different smaller stores, office space, hotel, apartments. It could even be torn down and become something completely new," Mathews said. There is a national blueprint that could indicate what might happen to the Nordstrom space. CBL Properties, which owns Oak Park Mall, has redeveloped other malls across the country. At the Brookfield Square Mall In Milwaukee, the company is putting in an upscale, high-end, dine-in movie theater, along with WhirlyBall, Mathews said. The city also bought about nine-and-a-half acres to build a hotel and conference center on the property. In Nashville, CBL Properties recently redeveloped an empty Sears store. "They brought in a bowling entertainment center, they brought in the Cheesecake Factory," Mathews said. 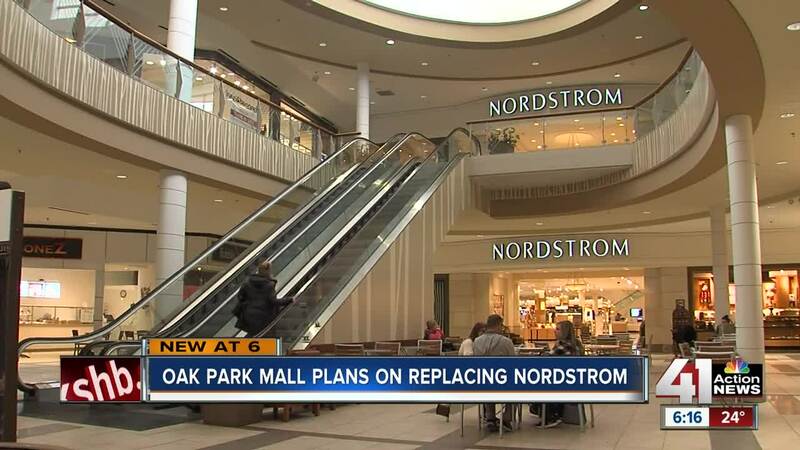 While there are no definite plans yet for Oak Park Mall, the size of the Nordstrom space creates a unique opportunity. "People don't realize that whenever a department store leaves, that actually frees up about 20 to 30 acres of land for any given department store because of the parking lot restrictions that they have," Mathews said. "So not only are we gaining the Nordstrom building, but also the parking lot space." On the other hand, when Nordstrom leaves, its customers might go with it. "I really come here for Nordstrom," Penny Vandiver said. "I do think it will definitely impact the mall overall. I think it's a big chain and it's a big name draw," Susan Perez said. Mathews said that officials know Nordstrom's departure will be a hit for the mall, but they hope that with a new identity, shoppers will continue walking the halls. “People are still wanting to be here. They are still loving the other shops and stores that we have,” she said. Some businesses have recently opened in Oak Park Mall. Wonder Wonder opened on Wednesday, and the women's clothing store Altar'd State opened in November. Dry Goods, a women's boutique store, is set to open in April.